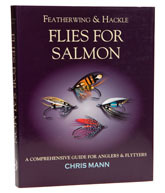 Yet another volume from the indefatigable Chris Mann, the first two, in case you missed them, covering Shrimp and Spey flies and Hairwing and Tube flies. If you are familiar with the earlier books, you will know what to expect, because this series is distinguished by the way it departs from the norm and is illustrated with computer graphics rather than photographs. If you haven’t seen the other books, don’t be put off, the idea sounds horrible, but in Chris’ hands, it turns out to be rather appealing; perhaps we shouldn’t be surprised, because the author’s day job is graphic design. The other feature that distinguishes this book is that it covers everything from the very earliest patterns, like the King’s Fisher, through early nineteenth century patterns, to the most modern flies available, along with a potted histories of some of the tyings and of salmon fly evolution in general. The first half of the book forms an illustrated commentary on European and North American patterns, while the second half is an illustrated catalogue of dressings, with a roughly fifty-fifty balance between classic and modern. Beginners will love the layout although one problem is that the fine detail of the tyings is obscured in some of the graphics.